And with apocalyptic inevitability, Evangelion 3.33 is delayed in the UK. Fans must now wait several more months to see the world end on their TVs, although the hiatus is liable to allow for more cinema screenings, of what is, after all, a cinema film. Identifying as a fan brings a sense of active entitlement. You love your favourite shows so much that you wear them on your chest and your pencil case. Their logos decorate your desktop. But that’s not enough, you want to get up inside the gubbins and see how they’re made. You want Making Ofs and interviews, and advance news of what will happen. Modern media encourages this; it practically demands it, and we can all agree that this is what fans sign up for. But does it really have to be so quick? Any artistic achievement in localisation is becoming almost impossible. Simulcasts and lightning-fast schedules have turned translation and dubbing into desperate triage. This whiplash turnaround, supposedly, is designed to thwart pirates. But the pirates are serving a market of viewers who want everything yesterday. I guarantee you, if you made watching anime your lifelong career, you would never have the time to see it all. So take it easy. Smell the flowers. Delve in the backlists for shows you might have missed. I’m shocked at the number of self-proclaimed otaku, clutching the latest 13-episode flash-in-the-pan fanbait, who have never seen Akira, or Cowboy Bebop, or as a bunch of big-name podcast pundits recently confessed, Voices of a Distant Star. I wonder what these people think they are fans of. Presumably it’s That Thing That’s On Right Now, and they get angry because someone in a London office has to change an entirely notional date on a spreadsheet. But if you do really need it that much, that soon, maybe you need help. Let’s make this five-month gap an Anime Spring, when everyone can try something that’s new to them even if it’s old to Amazon. The delay has bought you five months to do something else. So pick something you’ve never seen and give it a whirl. And write in to NEO to say what you’ve found. Jonathan Clements is the author of Anime: A History. This article first appeared in NEO #121, 2014. 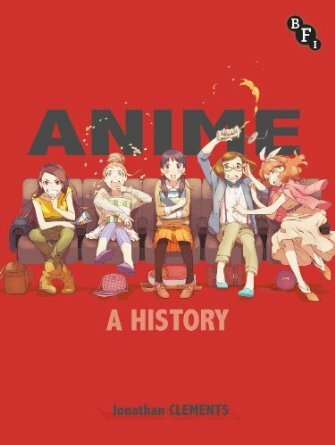 Some very nice new reviews recently for my Anime: A History, out now from the British Film Institute. I don’t think I’m able to point you directly at the very positive reviews in print mags such as Neo, MyM and Sight & Sound, although the online ones are just as complimentary. 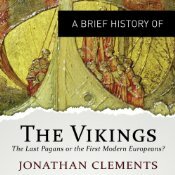 From A Brief History of the Vikings, by Jonathan Clements. The Icelanders’ own records mention around 400 original settlers, over fifty of whom had names that implied mixed Irish ancestry, or Celtic nicknames denoting considerable time spent outside Scandinavia. Their slaves and concubines (the mothers of many later generations) were also predominantly Irish, some of impressively noble birth. The Saga of the People of Laxardal mentions a haughty slave-girl with no appreciation of her duties, brought to Iceland already pregnant with the child of her Viking captor. She is eventually revealed as Melkorka (Mael-Curchaich? ), the daughter of the Irish king Myrkjartan (Muircertach? ), kidnapped at fifteen years of age. Faced with feuding women and clearly unable to control his Irish mistress, her owner eventually installed her in a homestead of her own across the river, recorded as the now-deserted site of Melkorkustadir. Not all of the Irish who accompanied the first settlers were ill treated. The Norse matriarch Aud the Deep-Minded, who figures large in the Icelanders’ tales of the first settlers, brought many Irish slaves with her from Dublin where her late husband Olaf the White had been king. After unsuccessfully relocating to Caithness, where her son Thorsteinn the Red was killed, Aud and her entourage gave up on the harsh life on the Celtic fringe and set out for pastures new. Aud would eventually free several of her slaves and set them up on their own – freedmen including Vifil, whose great-grandson would become the first European to be born in America, and Erp, a thrall whose mother was supposedly Myrgiol, an Irish princess sold into slavery in Britain. Although such tales often have the ring of truth, it is important to remember who was telling them – later generations of Icelanders hoping to put a polish on concubine ancestors by inventing noble backgrounds for them. Irish names certainly persisted among the Icelanders for many generations, including Njall, Kormakr, Brjan and Patrek.